On May 15th the town of Slave Lake, Alberta was hit by a devastating wildfire that forced the evacuation of the town’s 7,000 people. Over 400 homes were completely destroyed. Residents were not allowed to return until May 28th. Amongst the casualties was the Rotary Club of Slave Lake Public Library, a building that had been open only a year and a half, and occupied a complex that also housed the Town of Slave Lake municipal offices and government of Alberta services. 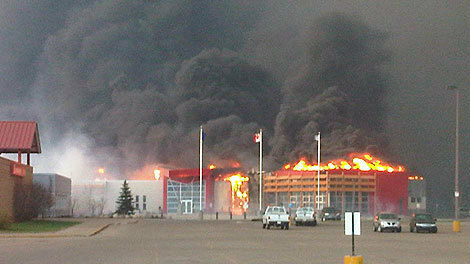 The photo above, of the building on fire, was posted on the library’s website. I’ve talked to Deborah Kendze, the library’s Regional Manager. In addition to losing the library, she was one of the unlucky residents who also lost her home. Everything in the 6300 square foot building was destroyed, leaving the residents without a local library until it’s rebuilt. The library board hasn’t yet had a chance to meet to discuss the loss and develop a plan to rebuild. Deborah hopes that can happen fairly soon. While both the donation of books and funds are offered as options on the library’s website, there is an emerging sense that financial donations are preferable over books and materials.